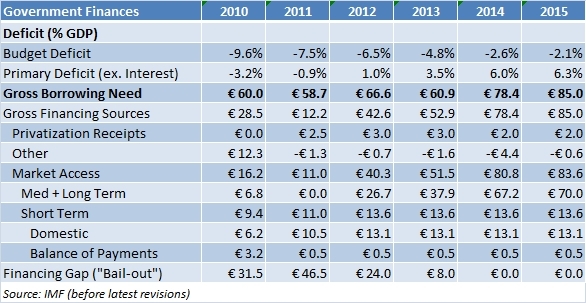 Eurostat has put Greece’s 2010 budget deficit at 10.5% of GDP, up from a previously estimated 9.6%. This revision matters not because it pushes Greece closer to default, but because it changes how a default would play out. Think about default in two dimensions. First, can the country borrow at reasonable rates? If it cannot, it will default. And second, in the absence of having to service an insurmountable debt, how do finances improve? 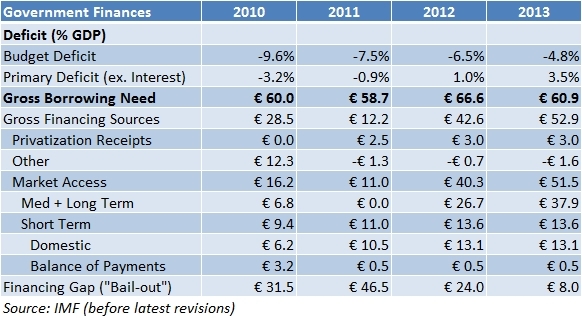 The relevant numbers for Greece are shown in this table. In 2011, the country’s gross borrowing need of €58.7 billion is covered without a need to issue long-term debt (short-term debt is cheaper since it carries less risk). 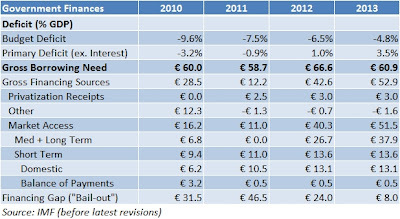 By 2012, however, the country was forecasted to need to raise €26.7 billion from the long-term market. 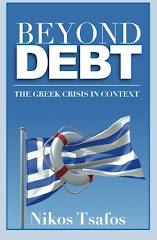 If Greece cannot raise this money at a reasonable rate, it would be forced either into default or another bailout. The other relevant number is the primary deficit, which is the deficit without interest payments. What is important here is that Greece ran a primary deficit in 2010 and was forecast to run one in 2011 as well. It was only in 2012 that the country was expected to run a surplus. In other words, even if the country spent no money to pay interest, its budget would still be in the red – thus, a default would not provide an immediate stimulus since the government would need to pair a default with raising taxes and/or cutting spending further. By 2012, however, the country was expected to run a primary surplus of 1% of GDP. At that time, if the country found it impossible to raise money from long-term markets, the government would be forced to default or ask for another bailout, but at least the act of default could offer some instant reprieve to the economy (alongside the obvious negative consequences of course). By not having to service debt, the government could either lower taxes or boost spending to the tune of 1%. The revision in the 2010 deficit, however, wipes out that primary surplus in 2012. In the event of an outright default, therefore, the government would need to complement a suspension of payments with more fiscal measures. This is the short-term equivalent of having all the negatives of default, but none of the positives. So the true significance of the new deficit number is not that it makes the debt math less favorable, but that it makes even the math of default more difficult.